With only four days to go until the City of Omaha hosts a Public Priorities meeting for the revision of the Transportation Master Plan, lets look at the costs of vehicle maintenance by mode. 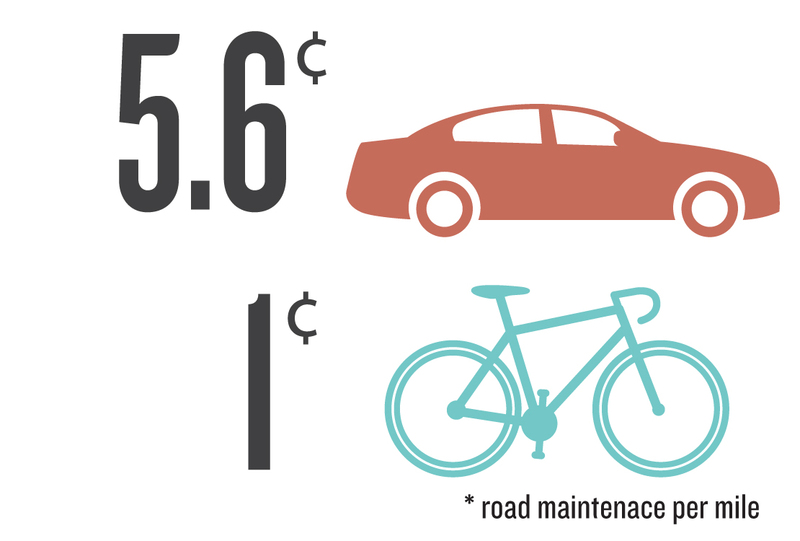 When comparing modes of transportation, one good practice is to show head-to-head costs. In a previous post we looked at annual costs for vehicle and bicycle ownership, but a time period isn’t very meaningful with transportation, an activity applied to distance. While the average cost of car ownership approaches $9,000 per year, that figure assumes 15,000 miles of travel. That is a lot of transportation. For cyclists to cover that many miles, they would have to pedal 41 miles every day of the year (and I’m sure many cyclists would love to do so, and there are a few who do, even in Omaha). But we know the average cyclist is not covering so many miles, so the comparison is not exact. These individual costs are highly variable and not a good measure of the community costs incurred by transportation choices. Perhaps a better point of comparison is the price we pay to maintain the roads for each mile used by these modes. For every mile an individual drives a car, we all pay 5.6 cents to repair the wear-and-tear and maintain the road. When an individual travels that same mile on a bicycle, the cost to all of us is one cent. The same mile costs us all 560% more when traveled by car. That’s something to think about. Every cyclist we see on the road is a symbol of savings. If you would like Omaha to save more money and offer more options, please come out to the Public Priorities meeting Thursday, September 15, 6:30 p.m. at the Scott Conference Center and voice your support of city savings and transportation options for everyone.